The plot of the recent film, “Paddington 2,” revolves around a one-of-a-kind pop-up book. In a wonderful scene, the good-souled, marmalade-loving bear is transported after opening the covers to movable parts within, unfurling into a dream of London (link here). Paddington declares it is the perfect gift (“like she were finally here”) for his adored Aunt Lucy in “Darkest Peru.” The volume is for sale in the Notting Hill antique store of his best friend, Mr. Gruber, a Hungarian refugee, a fellow “outsider” like the foundling. The bear cub was taken in by the kindly (human) Brown family when found alone in the railroad station. The movie is based on the children’s books of Michael Bond who died in June 2017 at the age of 91. A Bear Called Paddington, the first in a series, was published in 1958. There were fifteen Paddington titles in all, plus picture and gift books, a cookery book, and a guide to London. 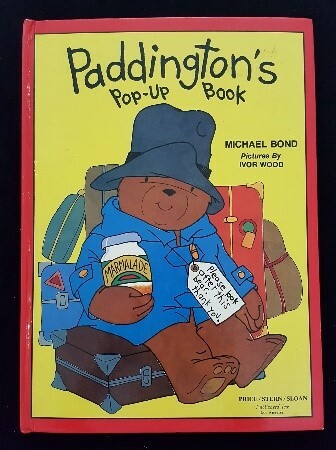 The Cooper-Hewitt, Smithsonian Design Museum Library in New York City has ten titles, all in the form of pop-up or sliding books, of the continual Paddington series. Mr. Brown and Paddington in the train station refreshment room. 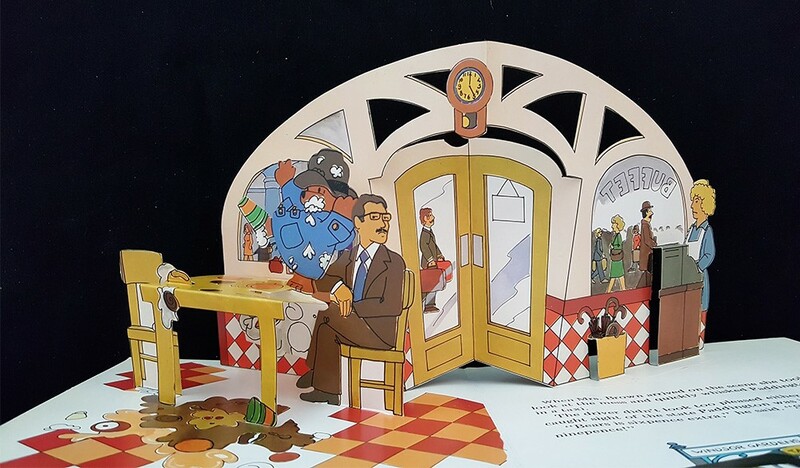 Three-dimensional or movable books are animated works that are created by “paper engineering.” A pop-up has parts made from stiff card stock that move when a page is turned. A sliding book, also known as a pull tab, or a dissolving image mechanism, has a Venetian-blind type of construction animated by a small flap that causes the image to transform into something different. 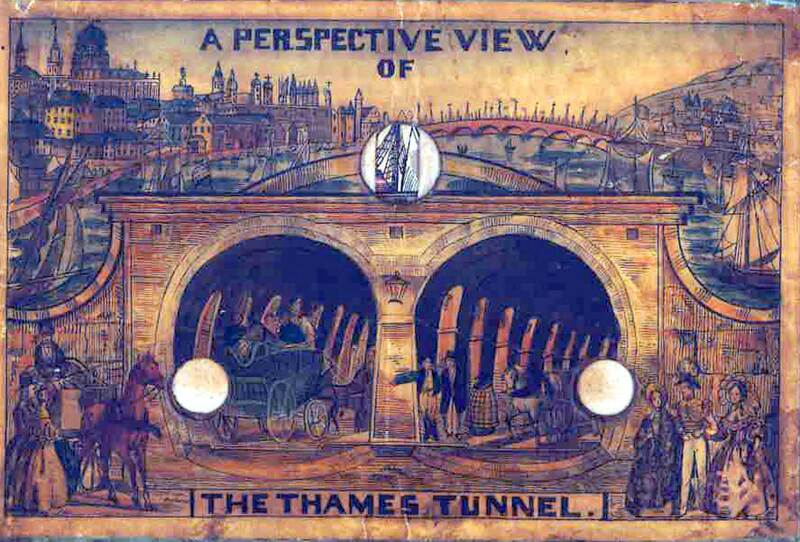 The Thames Tunnel was built between 1825 and 1843, joining the south and north banks. 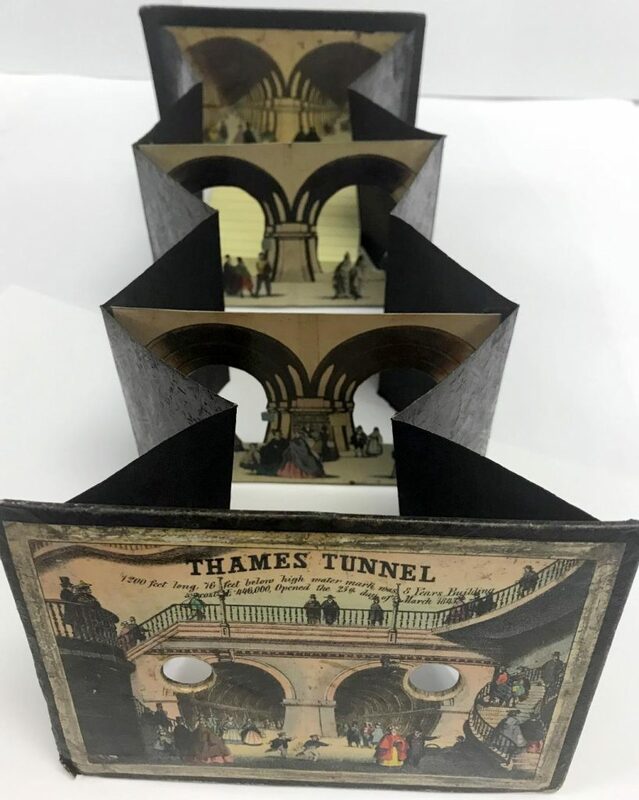 It was constructed with years of arduous work and disasters by Marc Brunel and his son, Isambard, employing the engineers’ innovative “tunneling shield” technology. Originally meant for horse-drawn carriages, this channel under the Thames became a pedestrian passage way with arcades for shopping and entertainment. The world-wide excitement of this technological marvel, the first tunnel built under a navigable river, was a great subject for the increasingly popular “peepshow” publications. They are made up of a set of etched, engraved or lithographed illustrated vignettes, attached to accordion sides of a perspective box. This construction, when extended, creates three-dimensional views observed through a hole in the cover. This form of printing art began in the 15th century as a means of scientists and artists to study optics and perspective. By the 19th century, peepshows, with inspiration from stage scenery, found a more general audience. 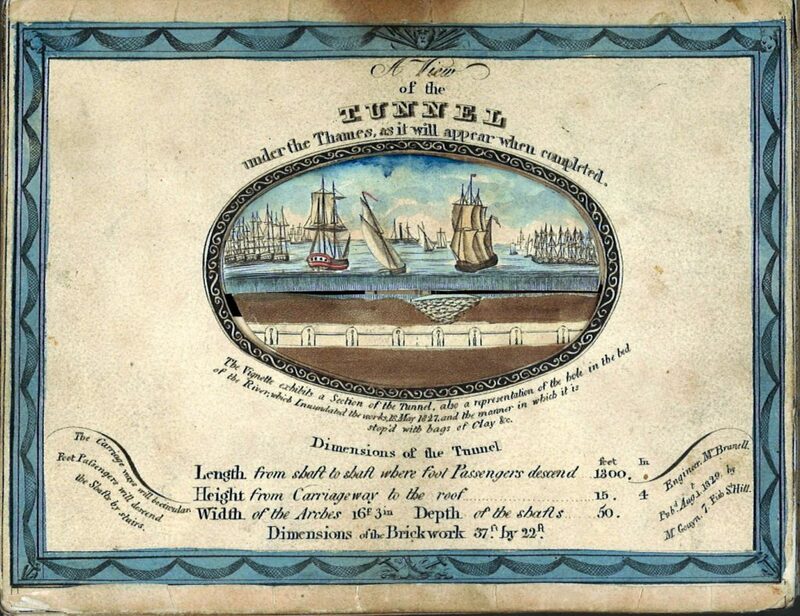 The Dibner Library houses an extraordinary range of Thames Tunnel peepshows as well as other related material, representing those produced from when the digging was just starting, around 1825 (with perhaps the first) into the 1850s. There is a theme of inclusion in these Tunnel books. Some show visitors in foreign dress, mingling in the melting pot that was and is London. But the technological marvel of the Tunnel had a short, public existence. It was closed to the public in 1869 and the Tunnel became a railroad line. 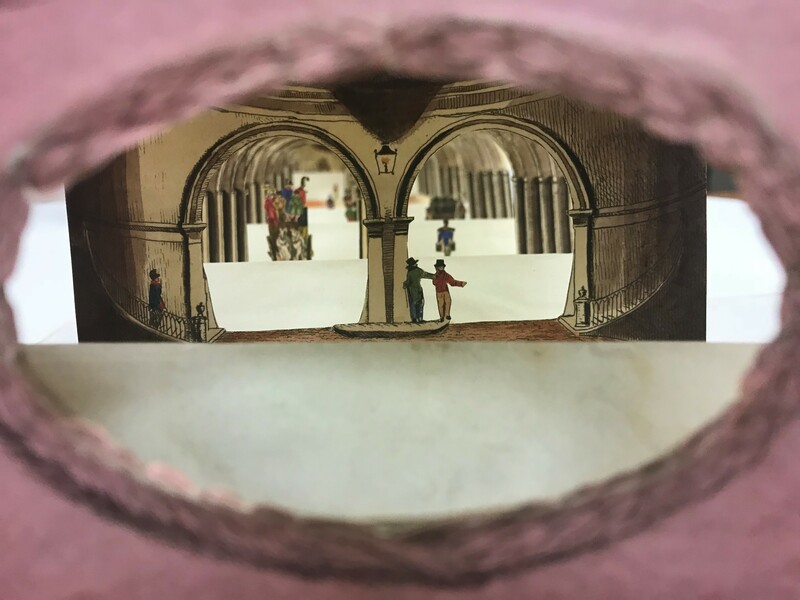 In contrast to the Dibner’s collections focused on science and technology, the Cooper Hewitt Design Library collects movable and pop-up books for the study of their illustrations and paper engineering as art. While the Paddington Bear stories were all written by Michael Bond, there have been a number of different illustrators over the years, among them Peggy Fortnum, Ivor Wood, Borie Svensson, John Lobban, and Nick Ward. They all feature Paddington with the iconic floppy hat from the first book in 1958 (The blue duffel coat and boots appeared later). In the first story, Paddington is found by the Browns with a note “Please look after this bear. Thank you.” The author Bond was inspired by the child evacuees leaving London on trains during World War II. In the November 2014 interview in The Guardian, Bond said “They all had a label round their neck with their name and address on and a little case or package containing all their treasured possessions. So Paddington, in a sense, was a refugee, and I do think that there’s no sadder sight than refugees.” Bond based Mr. Gruber on his literary agent Harvey Unna, who fled Nazi Germany. 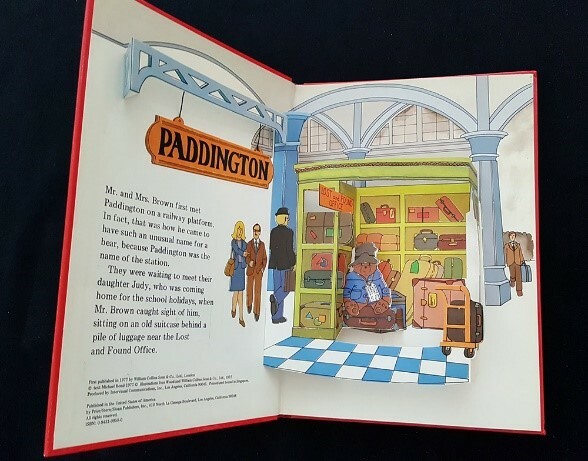 The Cooper-Hewitt’s Library’s earliest edition of Paddington’s Pop-Up Book, from 1977, re-tells the story of the little bear that arrives in London from Peru with his battered suitcase. The books tells of Paddington Brown’s past life, travels, adventures and life in London, which usually involve a considerable amount of mischief and mishaps. 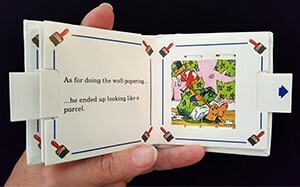 This collection of the Paddington bear movable and pop-up books was the gift of Dr. Daniel J. Mason, and their Preservation supported by the Smithsonian Women’s Committee in 2007. The popularity of movable and pop-up books continues to grow. They are designed in all sizes and shapes, with many innovative pop-up construction forms. 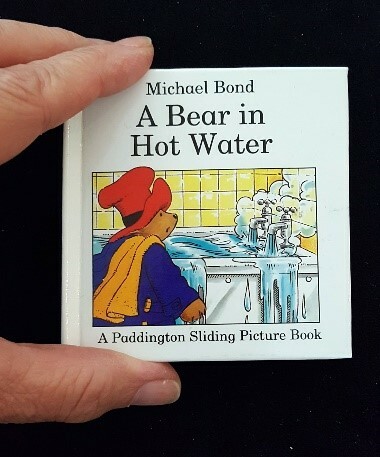 A Bear in Hot Water from 1995, and A Spot of Decorating, also 1995, are examples of a mini sliding picture book, measuring only 3 ½ “ x 3 ½ “ square in size. And now the latest is Paddington Pop-Up London of 2017 which may get another generation entranced with movable books. That book’s construction bears many similarities with Jennie Maizels’ Pop-Up London of 2011. While that title is not in the Libraries collections, the Cooper-Hewitt does have three earlier examples of the artist’s work: The Amazing Pop-Up Music Book, The Amazing Pop-Up Grammar Book, and The Amazing Pop-Up Multiplication Book. These paper-engineered book collections demonstrate the interconnections of our scattered branch library system, where relationships among our holdings are sometimes intentional, sometimes by happenstance. Some of these movable books can be thought of as the precursors of Google Earth VR. 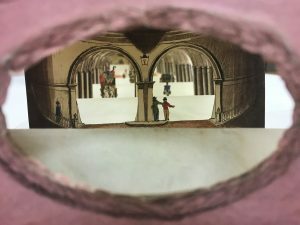 But the virtual reality of the pop-ups is perhaps better preserved, and more secure for the time being than digital technology, even given their ephemeral nature. The idea of connecting France and Britain by tunnel under the English Channel began as early as 1802, by mining engineer Albert Mathieu-Favier. The Dibner Library has many of the early printed proposals. 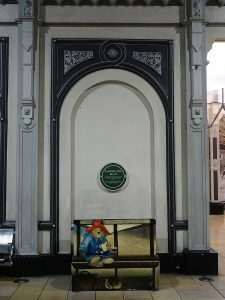 Our hero, the well-traveled Paddington in the form of a furry stuffed toy, was suitably chosen by the British to be the first object to be passed through “The Chunnel” to France when the two sides were finally joined in 1994. 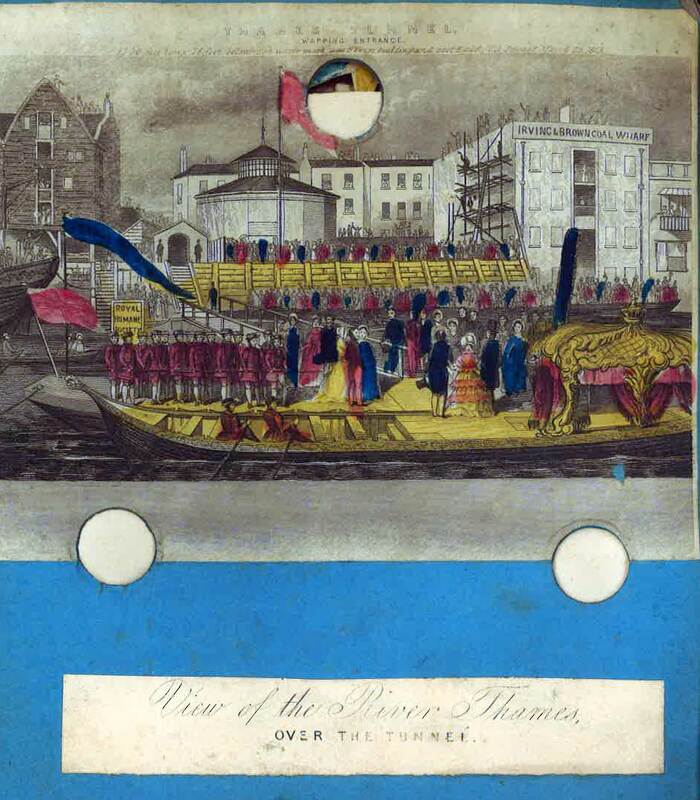 A view of the above-ground Wapping entrance with Queen Victoria and Prince Albert and entourage arriving for a visit by Royal Barge (record link).